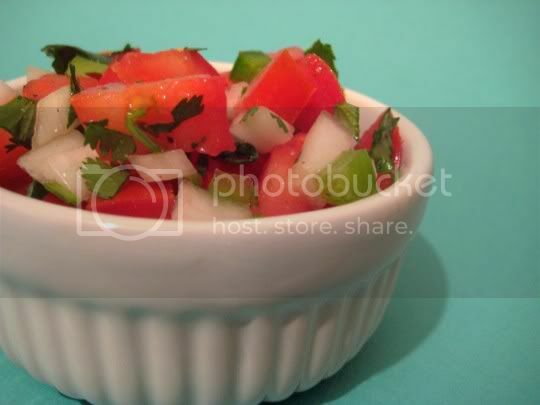 A simple, quick recipe for something closer to pico de gallo than salsa. This is nothing more than cut up veggies--tomatoes, onions, and fresh jalapeno--tossed with the classic Mexican ingredients, cilantro and lime juice. A little salt (emphasis on little) and pepper complete the flavors. This is best served right away, although a day or so worth of refrigeration doesn't hurt...just be sure to bring to room temperature before serving for the best flavor. Serve this salsa with enchiladas, burritos, nachos, quesadillas, you get the idea. Make again? Possibly. Great taste, but I think it would be easier to just buy a tub of the premade stuff. No! The premade stuff has all of the preservatives! My Grandma purees it and adds soooo much jalepeno, or habanero peppers and so little tomatoes that the flavor and color change quite rapidly, haha! Play around with it, different peppers, tomatoes, add garlic...it also last longer if you puree it.